I love peanut butter, and I LOVE peanut butter cookies! This recipe, which originally has only 3 ingredients and is gluten free, is super simple. Because I don't do well with much sugar, I prefer to sub half of the sugar for flour instead and get a less-sweet and more-healthy cookie. 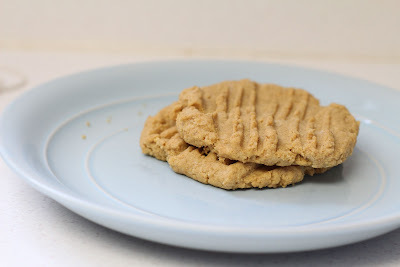 Each cookie in my version of the recipe has roughly 7 grams of sugar—pretty good for a sweet treat! Preheat oven to 350. Grease cookie sheet, or line with parchment paper. Combine all ingredients in bowl until thoroughly mixed. Form into golf-ball(ish) sized balls and press onto cookie sheet using tines of fork. Bake 8-9 minutes. Cookies will be VERY soft and fall apart easily when they first come out, so allow them to cool on the cookie sheet (placed on a cooling rack or unheated stove coil) for several minutes before removing. Follow directions for above recipe.